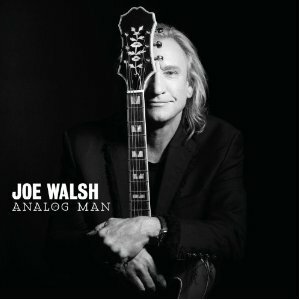 Rock and Roll Hall of Famer, Eagle member, rock and roll icon and all around ordinary guy, Joe Walsh, has released his tenth solo album, Analog Man. As has been touted in reviews and press around the world, the long awaited album is the Kansas native’s first solo release in twenty years and was ten years in the making. Boomerocity feels that it has been well worth the wait. Analog Man is a reflection of a man who has been through the fires of life, has lived to tell about it and is happy and content in his own skin and where he currently is in life – even being an analog man in a digital world. With nothing to prove, nothing to lose but plenty to share from his heart, Walsh shares songs that are introspective and prime for live performances which will make the album stand as a classic for many years to come. Before the Boomerocity view of this great album is shared, a comment must be made about some of the other reviews that are floating around out there. Some criticism has been leveled at Jeff Lynne and his production and playing efforts and their impact on the album. These people may very well be qualified to make such criticisms. I don’t know. I know that I am not so qualified and that I love the album. However, what I will say is that these people are obviously missing the point of Analog Man which, in my opinion, is that Walsh wishes to share the lessons he’s learned, the observations he’s made and the gratitude he has from a life that is extremely blessed. To those points, Boomerocity would like to highlight a few of the ten tunes that grace the album. The first being the title cut. With words like, “The whole world’s glued to the cable TV, it looks so real on the big LCD. Murder and violence are rated PG, too bad for the children – they are what they see . . .”, Joe sites a sad indictment and the societal regression we try to label as progress. The man calls it as he sees it in his own witty way that we’ve all loved for all these many years. Wrecking Ball is Walsh’s attempt at waving off the current generation of entertainers who are living their life on the self-destructive edge, tempting fate and eternity. He observes, “You’re at the table, it’s the same old game, double up the bet, you keep hoping that your luck will change, hasn’t happened yet”. Other great songs like Family, Lucky That Way and Band Played On (with a little help from his brother-in-law, Ringo Starr), are sure to create many a pleasurable earworm to the listener. However, I believe that the fan and crowd favorite of this entire CD will be Funk 50 – an obvious sequel to Walsh’s hit with the James Gang, Funk 49. This song alone is worth the price of the entire disc. Analog Man is definitely one of the best albums one can add to their listening library this year.